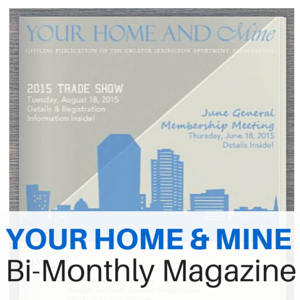 Your Home & Mine is a bi-monthly publication of the GLAA. This online magazine, published once every two months, is one of the primary ways the GLAA communicates upcoming events, member happenings, legislative information and committee updates. The magazine is posted on the GLAA website and emailed to all members. GLAA members look forward to getting the GLAA Your Home & Mine Magazine every two months and they definitely support the businesses who sponsor the magazine. They know that without these sponsors - the magazine simply would not be possible. GLAA understands that advertising in an online publication is much different than having a hard copy in the hands of our members. So, we want to add value for those who sponsor our Your Home & Mine Bi-Monthly Magazine. We have added INCENTIVES such as Social Media Blasts, as well as complimentary sponsorships of our "What's Happening Wednesday" E-Newsletter and the GLAA Calendar of Events portion of www.greaterlaa.com, if you advertise at a specific level or above! Let us know if you have questions!